For a few brief moments today, the CNN top story was that the Obama administration officially announced a $1.42 trillion deficit in fiscal year 2009. While perhaps not news to anyone paying attention over the last six months, it still made for a stark image on the front of CNN.com. In August, the OMB projected a 10-year deficit of $9 trillion, assuming President Obama’s 2010 budget proposals are put in place. A deficit of that magnitude means the debt held by the public would approach 82% of gross domestic product. That’s double the 41% recorded in 2008. Most budget experts blanch at the thought, especially given that the country’s fiscal future was already a source of concern before the economic crisis because of expected shortfalls over time in funding for Medicare and Social Security.Of course, this really shouldn’t be news to anyone. 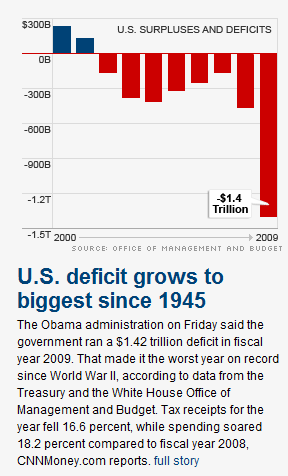 Back on March 24th the Heritage Foundation published a comparison between the Bush and Obama deficits. The graph from that article has been posted countless times by numerous bloggers. With the announcement made today by the Obama administration, the predictions have become reality and even CNN couldn’t avoid publishing the results.